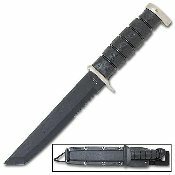 The combat knife is a vital and much-needed tool in the world. This particular model is designed to cut through rope, brush, or anything else that could get in your way in the middle of a struggle. Complete with a hard nylon sheath that reads, "Tactical Assassin", this piece of equipment is lightweight and easy to carry. The rubber handle is fitted with grooves for a more efficient grip. The blade is forged from 440 stainless steel and has saw-teeth on one side with a razor sharp edge on the other.